When it’s melted and hot put the slice of bread with the hole into the pan and let it cook until it goes a little brown. Flip it over and break an egg into the hole in the middle. Cook for about 3-4 minutes then scoop it out carefully with a spatula and serve it with the toasted shape on the side to use instead of a traditional ‘soldier’. 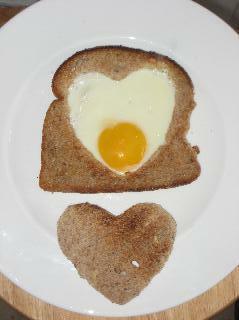 Or Why not just cut ‘Love’ shapes out of toast, you could even spell out your lovers name. You could also cut out heart shapes of sweet waffles, and add syrup, cream or strawberries. Serve with a Mug/ Pot of Tea and maybe a hand-picked single flower for effect. A love coupon book makes a great Valentine’s day gift for your partner. Romantic coupons can be as elaborate as you wish. Combine loving, playful and naughty coupons for your love coupon book. You can use your computer or you can create a handwritten book the choice is all yours! All you need to do next is decide what to include in your love coupon book. A full body massage, breakfast in bed and a movie date of their choice are all a good start. You could also include coupons for passionate kisses, sexual fantasies or even a weekend away. Be sure to personalize the love coupons for your partner. Re-discover your inner teenager and go on a proper, retro-style date! Simple pleasures, like heading to the local beauty spot for a walk, a stroll along the beach, Or how about a trip to a gallery or museum, or perhaps leisurely stroll around the local market are all great ideas to spend some quality time together, anywhere that you can do something fun together will make a great date remind you why you fell in love in the first place. Smile Box is a FANTASTIC way to put all your memories & pictures of you and your Partner together and make a loving ,heartfelt gift. With Smilebox you can upload any photos quickly and easily create slideshows, invitations, greetings, collages, scrapbooksand photo albums right on your computer. With more than 1000 customizable templates to choose from, you’ll find inspiration around every corner. Smilebox is free and there are plenty ways to share: Facebook, email, blog, printing at home or to a store, and burning to DVD. Smilebox makes a fantastic free & thoughtful gift that is easy, unique and memorable. You could create your own love story using your photos from the fist day you met until today, or you can send special messages or create funny & cute collages & greetings. It’s a little cliched but sharing a romantic meal on Valentine’s Day is a great way to enjoy each other’s company and a natural choice if you’re struggling to find a babysitter. Whether you prepare it as a surprise or approach it as a joint effort with plenty of planning in advance, it’s an evening you can both look forward to, with great food, great company and lots of time to simply chat and be together. Add some Rose petals to the table or some candles for added effect. Have a glass of wine and some chocolates ready to nibble on by the side of the bath. After a relaxing soak, get out the exfoliaters, moisturisers, body creams, face masks, and foot rub cream and treat your Lover or give each other the attention you both deserve. The most important thing to do on Valentines day is Talk, talk, talk! Sometimes the most sincere and memorable activity is to sit, talk and enjoy each other’s company. Perhaps put some music on, light a candle and have a flick through some old photograph albums from your wedding, special holidays or pre-baby days. Previous Post How to Look and feel your best at all times! Getting more time from your day. Next Post Want to lose weight? Want to eat unlimited amounts of pasta, potatoes,meat etc? Try Slimming World for free with my plan. I like this valenteines day ideas here. Reblogged this on Bridget Of The North.